SpaRitual Wilde Fall 2011 Nail Polish Collection. We cannot help but wonder about the hottest nail polish hues of the next season, so we are always on the look for fabulous nail polish shades brought to us by the most important nail polish brands. The SpaRitual brand certainly suggests some interesting color alternatives for the season, so take a closer look at it to be able to determine whether or not it will be on your shopping list. "The Wilde woman embodies her authentic self while moving with the natural rhythms of life. These jeweled lacquer colors represent her warmth and strength and have a mystical depth of color in each layer. 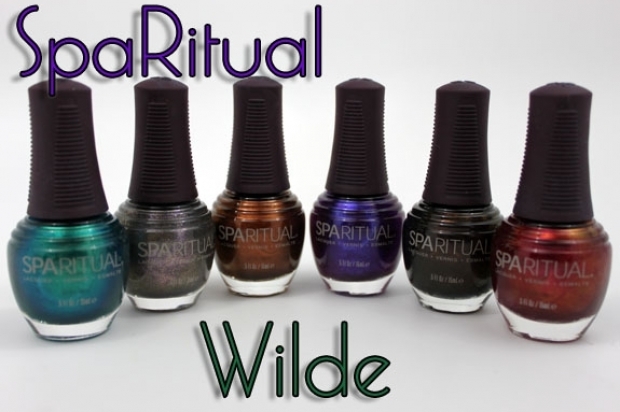 Wilde shades include Spirit Child, a fiery red shimmer, Running with Wolves, a rich copper patina, Rhythm of Life, a glistening emerald, Instinct, a majestic, shimmering purple, Howl, a deep, golden black, and Sacred Ground, a sparkling grey." SpaRitual founder & CCO, Shel Pink explains the main purpose for the collection: "The Wilde collection encourages women to tap into their truest selves, and express themselves through feminine, sensual colors." However, fascinating rich hues are not the only strong point of the collection. The brand's eco friendly attitude is also extremely impressive. Aside from the commitment to avoid potentially dangerous chemicals such as DBP, formaldehyde and toluene, the brand also takes a few steps further. All these lust-worthy hues are vegan and moreover, the nail polish bottles are made with 50% recycled glass in order to prevent unnecessary waste.The collection is set to be launched in September and each nail polish shade will be retailed for $10.